Just a quick post to wish everyone Happy World Book Night. 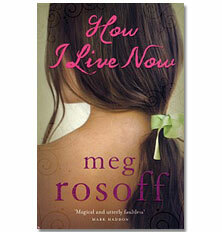 Today I was giving out copies of How I Live Now by Meg Rosoff which is one of my favourite books. I dropped a few into staff pigeon holes in the morning and then got some kids I teach to come up to my room at lunch time (without telling them why) then gave them all copies of How I Live How along with their choice of whatever random books I had laying around at home that I was going to find a new home for. Very excited kiddies indeed which was lovely. Something I might need to do more of. Oh, I love How I Live Now. Those kids are in for a treat! I gave away Pride and Prejudice. A wonderful experience. I gave away I Capture the Castle which is a great book. I had loads of fun doing it, I'm giving away two more copies on my blog as well for people who might not got a chance to participate in it. I hope they all enjoy it! I applied to be a give but rather late and so didn't get any of my choices. A brilliant book to give away. Sounds like you made a few people's day!